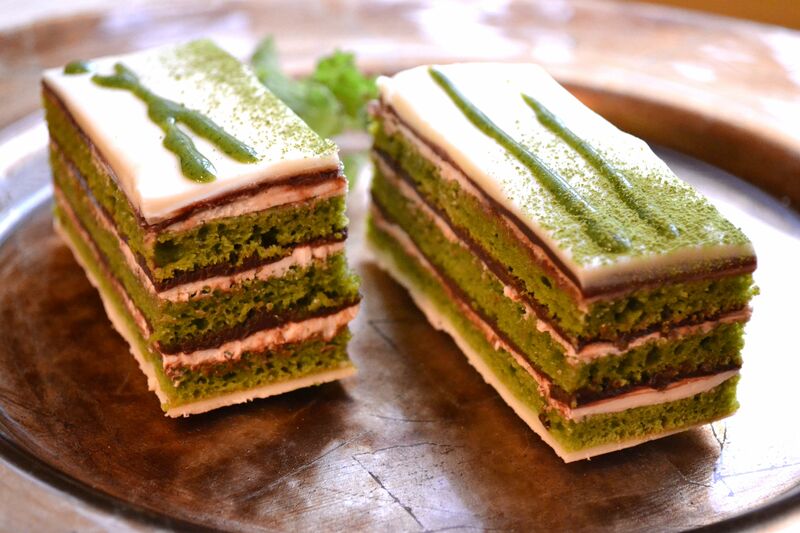 After talking with a friend about Japanese~French Pastries, I was inspired to create a dessert using matcha. 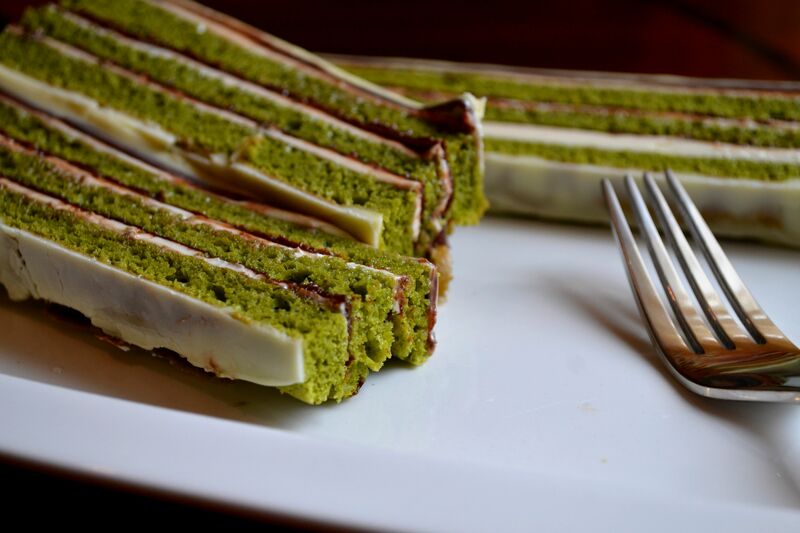 I’m a visual person, so I couldn’t wait to work with the lovely green hue of matcha powder. 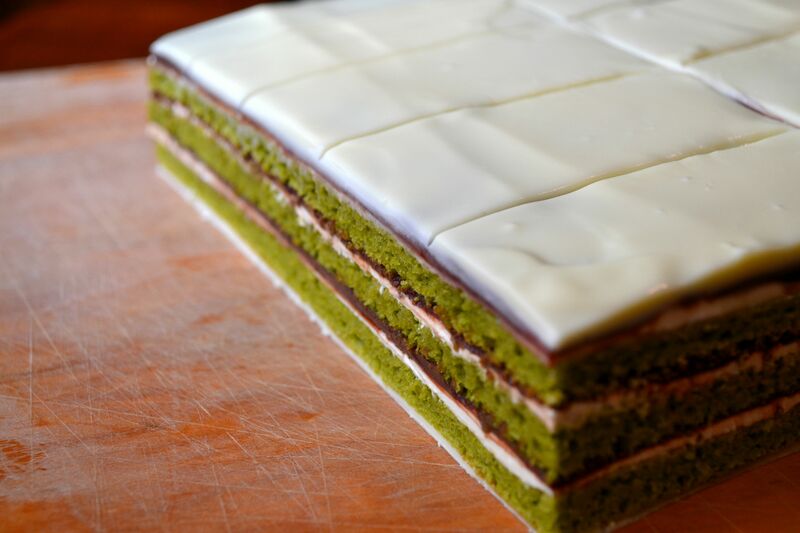 I’d also been wanting to try my hand at making an opera cake, so when I found this recipe online it was perfect! I’m including the recipe and instructions below word-for-word from the website. I’ve added my own photos and some tips I learned as I worked my way through the directions. The only real change I made to the recipe was using white chocolate for the glaze. 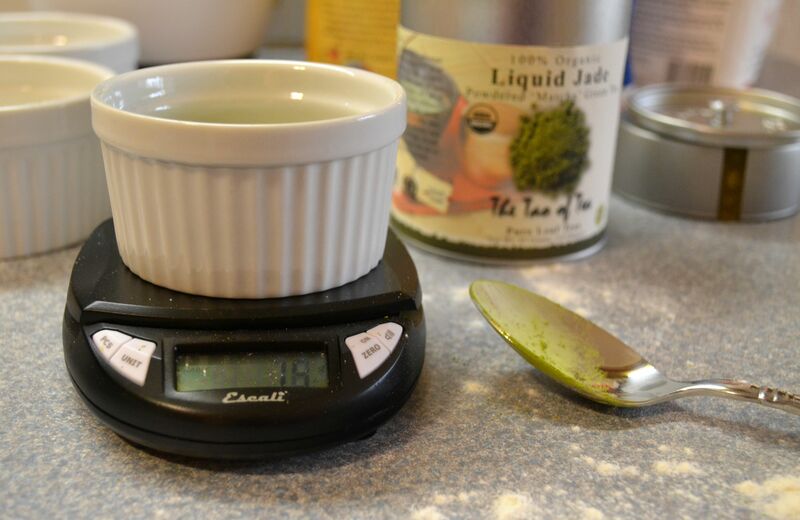 I chose The Tao of Tea‘s organic Liquid Jade powdered “Matcha” Green Tea. It’s mild and fine but, best of all, it’s local. 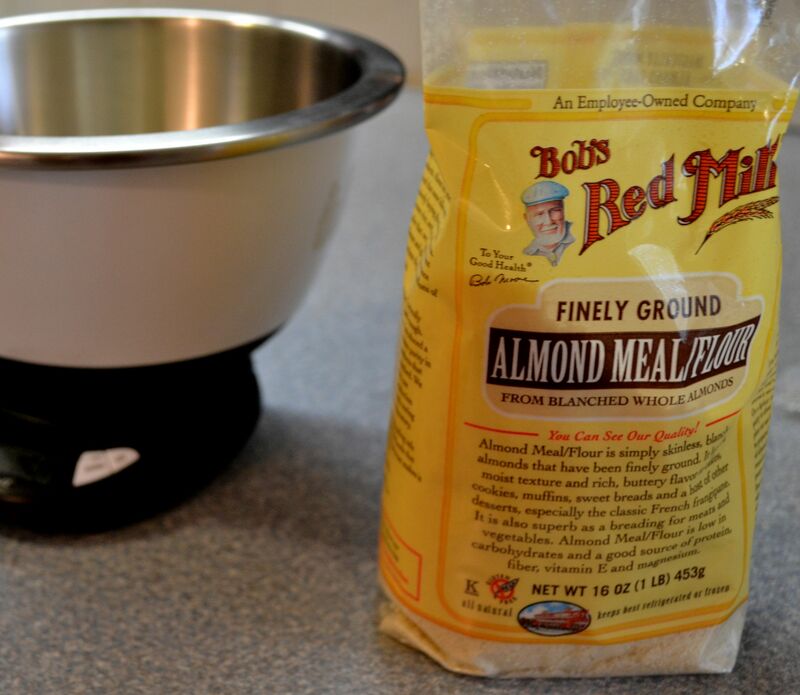 So is Bob’s Red Mill Almond flour. Tip from me: Set out your eggs. Eggs should always be room temperature when you’re baking. If you don’t have time to set them out, you can place them in a bowl of warm water until they reach room temperature. And if you don’t have a scale, get one. 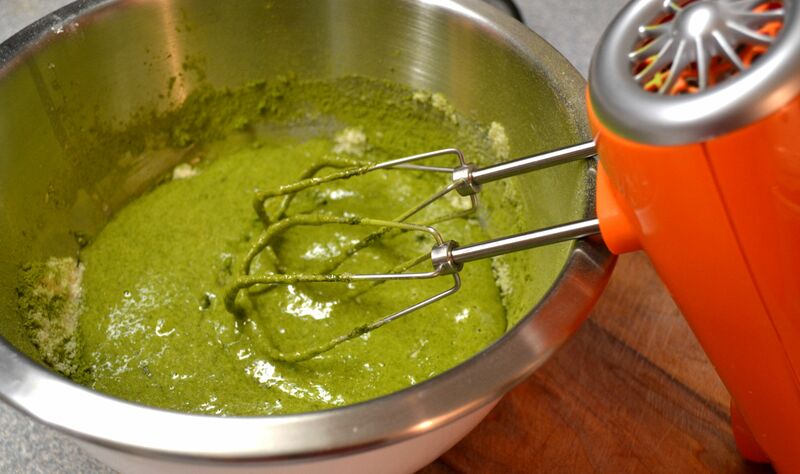 In the bowl of an electric mixer combine the first five ingredients. 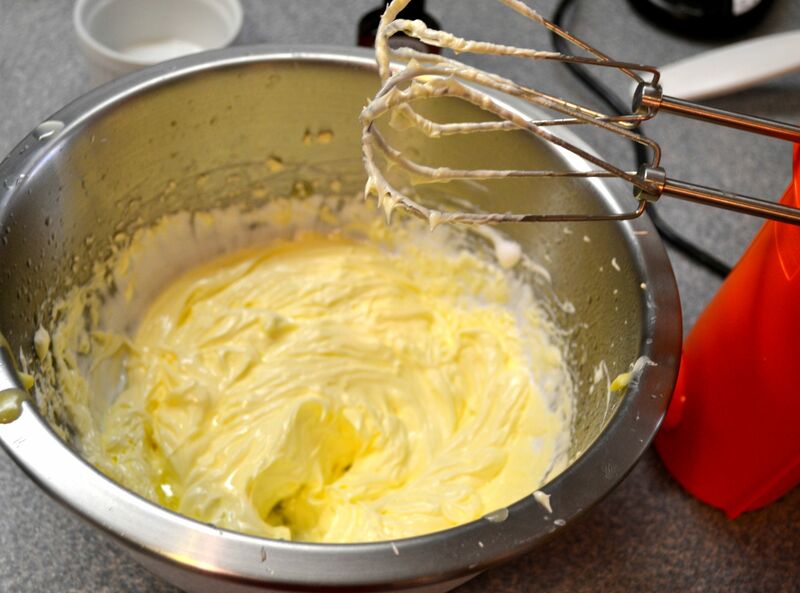 Whip in high speed for about 5 minutes until it becomes thick and the batter forms a ribbon. Transfer this batter to a large bowl and clean the mixer bowl. 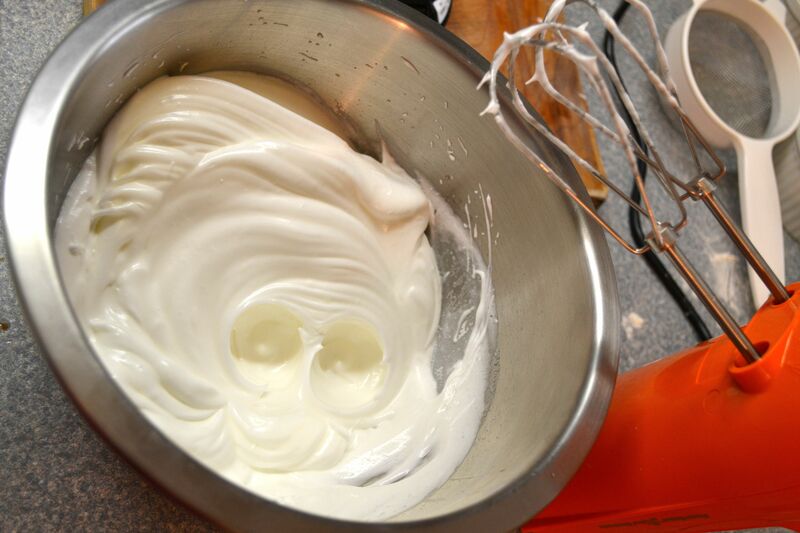 In the electric mixer, whip the egg whites until it starts to form a meringue. Slowly sprinkle the 55 grams of sugar. 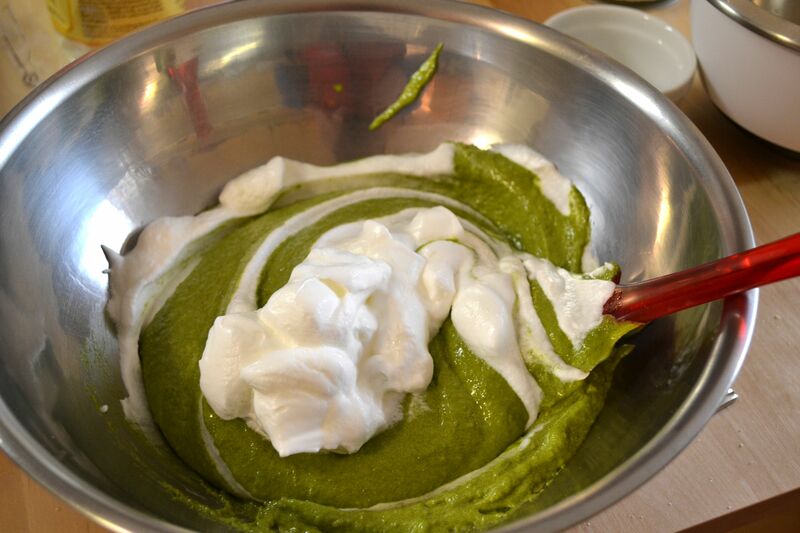 Continue whipping until a stiff meringue forms. Fold a third of the meringue into the almond batter. Add the rest of the meringue and fold carefully not to deflate it too much. Add the melted and cooled butter and fold until it is well incorporated. Batter meets meringue. Fold in gently. Bake in a 375 degree oven for about 10-12 minutes until it starts to turn a little brown. We don’t want a brown cake. 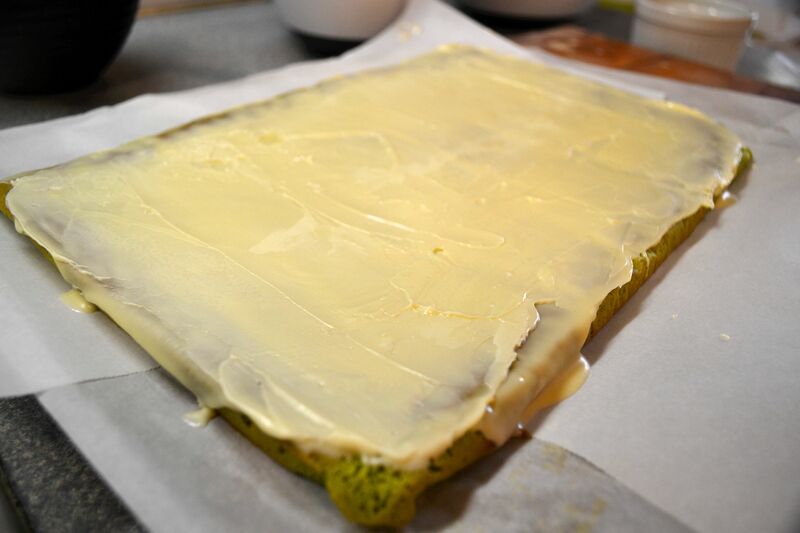 We want to keep the green color so remove the pans from the oven when the cake is baked and before it starts to change color. Let the cakes cool until we are ready to assemble the opera. 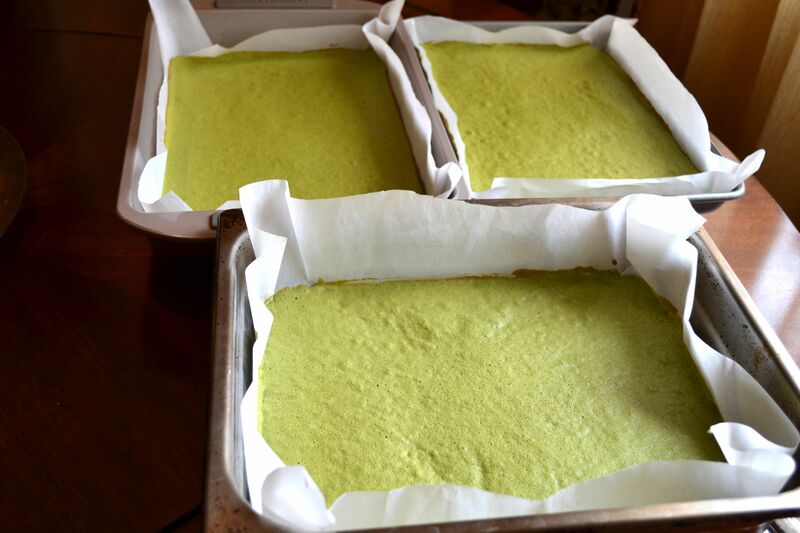 Green Tea Sponge cakes, happily cooling. Start adding the softened butter by the tablespoon. Keep adding more butter as it is incorporated into the meringue. Once all the butter has been added, add the lemon juice and the lemon oil/extract. It might look as if the buttercream has separated. Don’t worry, keep whipping it because it will come together. Reserve until ready to use. Chop the chocolate into a bowl. Boil the cream and pour it over the chocolate. gently whisk the cream and the chocolate until the ganache is formed. Do not over whisk or it might separate depending on the type of chocolate you have used. We want the ganache to be liquid when we assemble the cake so I recommend making this right before or make it ahead of time and remelt it right before we are going to make the cake. Boil the sugar and the water until the sugar has dissolved. Remove from heat and add the lemon extract. Set aside. Melt all the ingredients together over a double boiler and keep warm until we are ready to assemble. 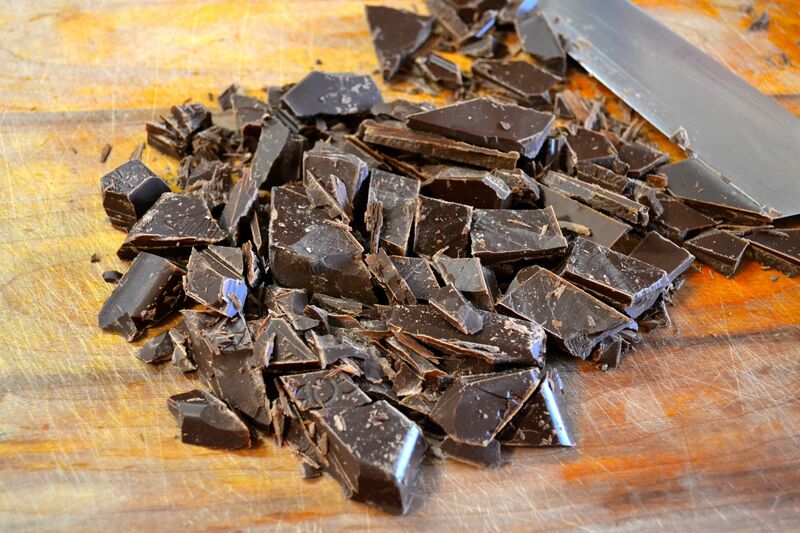 Rather Important Tip from me: *Chocolate coating, by the way, is a mixture of your chocolate + shortening. I used 1 cup: 1 tsp. You’ll want this glaze to harden. I followed this recipe exactly but my glaze was still soft upon cooling. To remedy, I heated it slightly in the microwave (6-8 seconds) and added more hard chocolate from the box. It worked to temper my chocolate so the glaze would harden. Success! Test it for hardening on the back of a spoon before you pour it on your cake. The most important thing when you are building a cake with many components, is to set your self ready for success. That means, get your mise en place ready. Clean your work area of pots and pans and line all your components in front of you so you don’t go crazy and you work clean. Working clean is 75% of the success in your final product. I promise! So get your sponges ready, the melted chocolate glaze, the melted ganache, the room temperature buttercream, the simple syrup, an offset spatula and a rubber spatula. 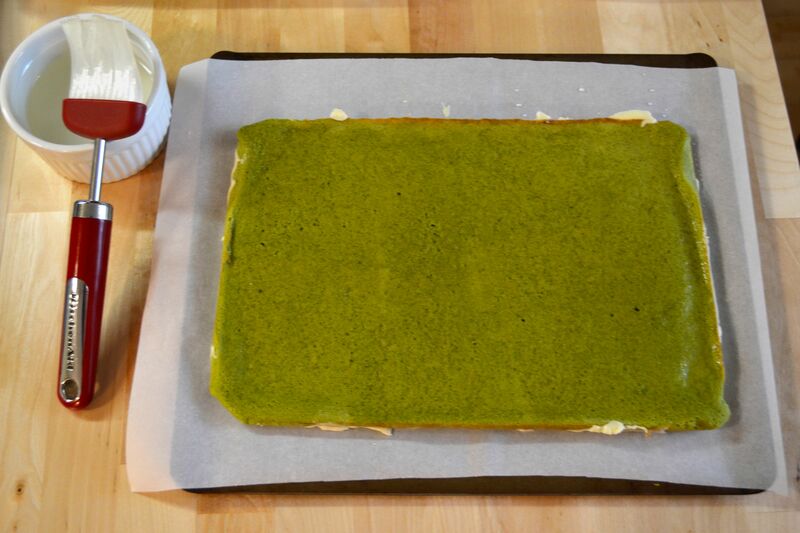 Place the first sheet of matcha sponge on your working surface. It will still have parchment paper on the bottom of the cake. Spread a very very thin layer of chocolate glaze on the top of the sponge cake. Spread the chocolate very thinly over the entire surface of the cake with a metal spatula (offset spatulas work best). Let this glaze harden. Soak the cake with the lemon simple syrup with the help of a pastry brush. 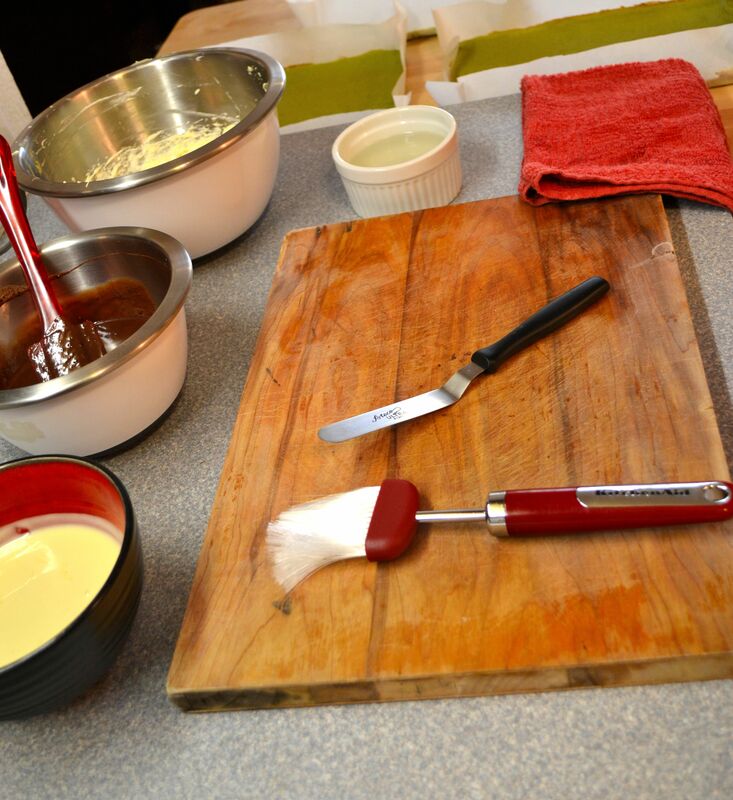 Then spread a third of the buttercream over the cake with an offset spatula. 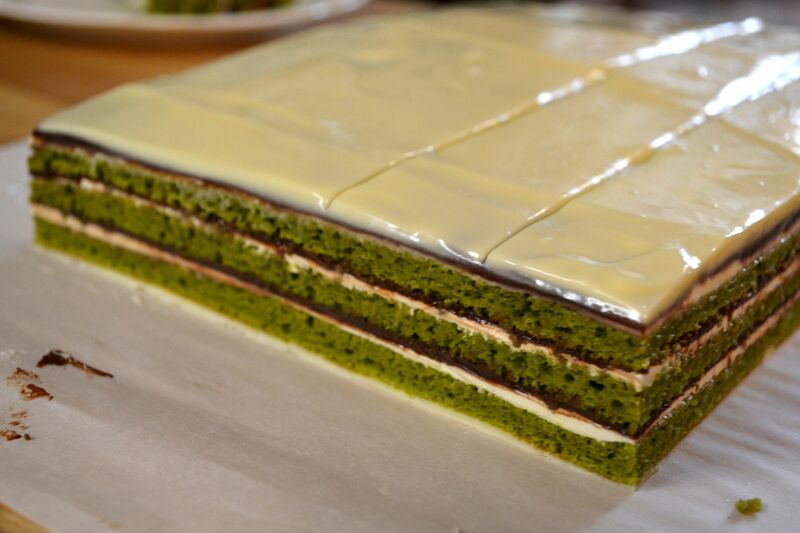 It is important to have an even layer because when we cut the cake, we want it to look clean and straight. Buttercream layer. Try to keep an even thickness. 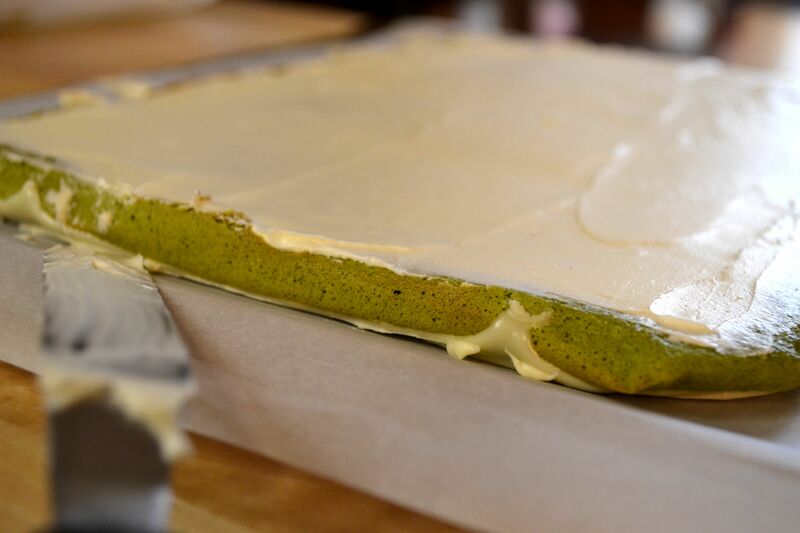 Place a second sheet of matcha sponge over the ganache making sure that the parchment paper that was on the bottom is now facing up. Remove the paper and brush the top of the cake with the lemon simple syrup. Spread half of the remaining buttercream over the cake, then spread half of the remaining ganache over it. Place the last sheet of sponge on top. 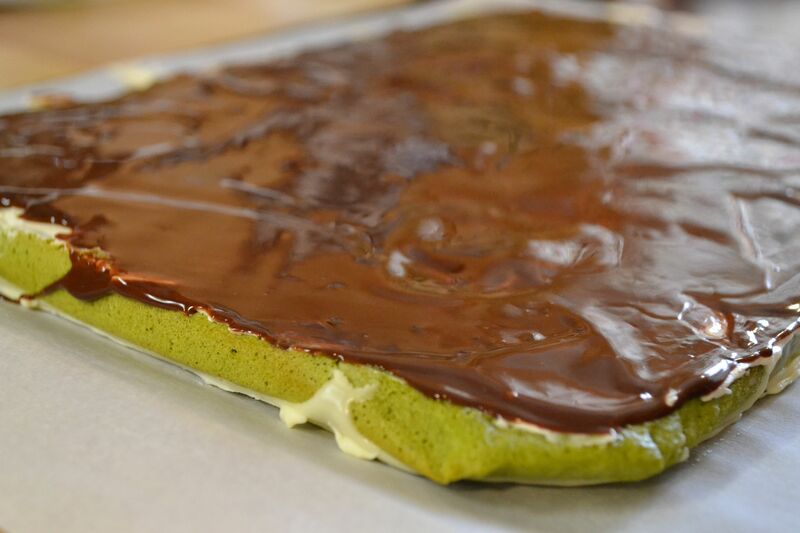 Brush with simple syrup, spread the last bit of buttercream on top and finish with the ganache. 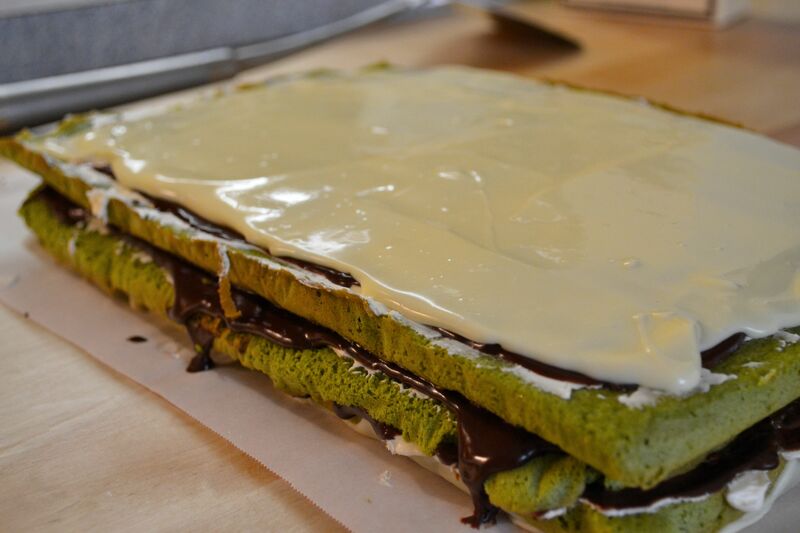 There will be a total of 3 layers of sponge, 3 of buttercream and 3 of ganache. All three layers. See the short middle layer? Refrigerate the cake until the ganache sets. Edges trimmed. Cleans up nice, huh? Score the glaze to get clean portion cuts later. 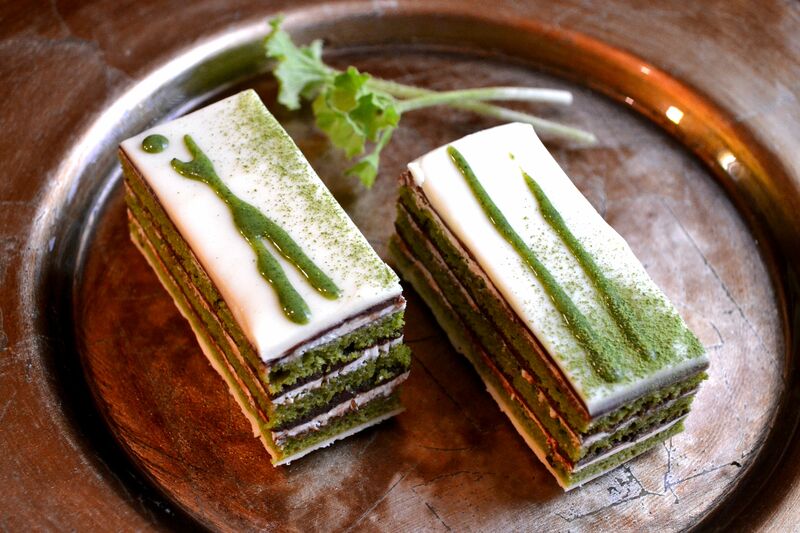 I used sweetened condensed milk colored with matcha powder to draw simple lines, then dusted with tea. 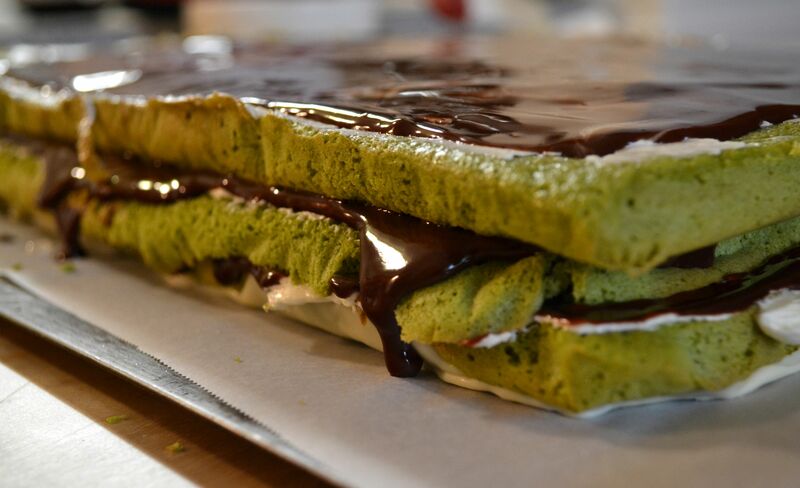 This entry was posted in Cakes, Chocolate and tagged almond flour, buttercream, cake, chocolate, Green Tea, lemon, matcha, meringue, white chocolate. Bookmark the permalink. I was wondering if I could use yuzu instead of lemon? Do you think that would work ok? I would assume so, but I haven’t used yuzu. It sounds stronger than lemon juice…? I still think it would work because the lemon flavoring is just a small part of the overall dessert. Good luck with this! It was delicious and fun to make! Hi! Thanks for checking out the blog! The cake pans I used were all 9″ x 13″. Send a photo along if you decide to make this. I’d love to see yours! I had the opportunity to sample this dessert today! 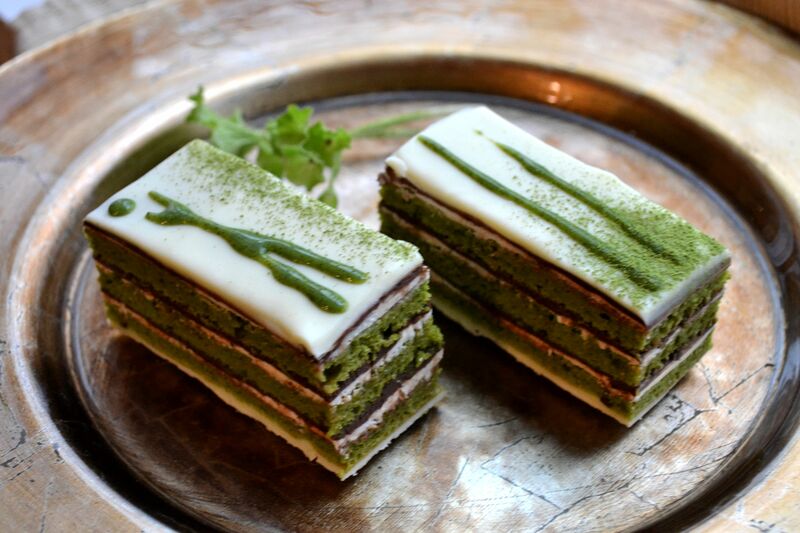 What a wonderful blend of subtle flavors… And the chef is pretty cool, too! You are an artist in everything you do! This looks incredible!! Thanks, Shawn! It was an all day project. Perfect for a rainy Portland day.